Analysis: Could the Seahawks be listening trade offers for Frank Clark? Because Clark's longterm future with the Seahawks is not secure, rumors are circulating teams may see if he's available in a trade as the free agent signing period approaches. 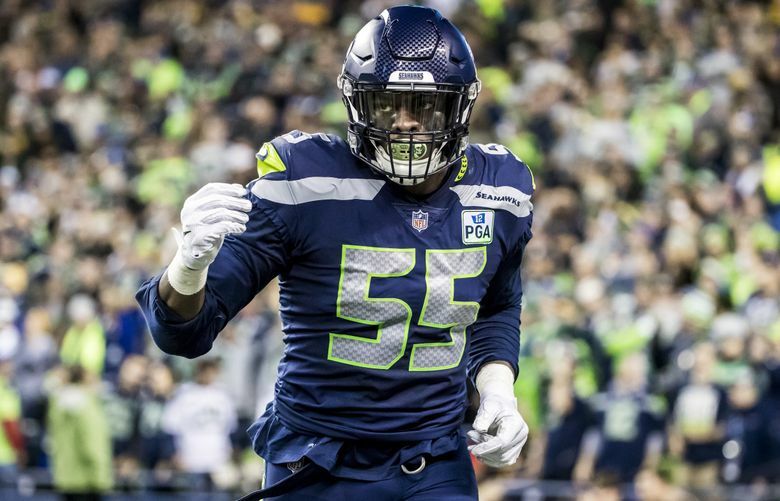 A few tweets from longtime NFL writer/announcer Jay Glazer Friday suggested an eyebrow-raising potential occurrence — the Buffalo Bills calling the Seahawks to ask about trading for defensive end Frank Clark. So take all that into account, as well as the fact that NFL free agency begins next Wednesday and this is the time of year when a lot of stuff gets thrown out there. Indeed, Morgan, who is now Buffalo’s Director of Player Personnel spent seven years with the Seahawks before leaving for the Bills in 2018, rising to the level of pro personnel director before departing. (Intriguingly, his agent as a player was Drew Rosenhaus, who is also the agent for Antonio Brown, which is sort of another story but also interesting given the Bills-Steelers-Brown rumors). Another tweet, from Chad Forbes of NFLDraftBites, suggested that the Colts might also be interested in Clark if Seattle were interested in moving him. Indy’s organization also has some Seahawks ties with former Seattle senior personnel executive Ed Dodds now serving as the Colts’ assistant general manager. It’s worth adding here that Saturday morning, at least two reports — including from Jason La Canfora of CBSSports.com — stated that Buffalo does not have an interest in trying to trade for Clark. But until Clark’s long-term future is secured, don’t be surprised if rumors continue to circulate — and if teams are really calling, the Seahawks have no choice but to listen while Clark is not under contract. To recap, the Seahawks earlier this week announced they had placed a non-exclusive franchise tag on Clark for the 2019 season, which would pay him $17.128 million. Clark was due to become an unrestricted free agent on Wednesday if not tagged or signed to a new contract. But the tag doesn’t assure Clark’s long-term future with the Seahawks, with the two sides still hoping to work out a longer contract. Teams have until July 15 to work out contracts with tagged players or else the player then has to play on that tag and the two sides cannot negotiate again until after the season. Being tagged means Clark can negotiate with other teams. But any team that would want to sign Clark would have to give up two first-round picks, and Seattle would also have the right to match. Therein lies the reason the Seahawks could be interested in listening to offers about Clark, or that other teams at least want to seek out the Seahawks just to make sure. If Seattle thinks it can’t get a long-term deal worked out with Clark then it could well entertain the idea of a trade now rather than risk losing him as a free agent following this season for what would at most be a compensatory draft pick. Seattle wouldn’t logically use the tag again on Clark in 2020 since that would mean a salary in at least the $20 million or so range, and it also might want to have the tag then to use on Russell Wilson or Bobby Wagner, if need be (both Wilson and Wagner have contracts that run out after the 2019 season). Conversely, other teams may be approaching the Seahawks to get a sense of how serious Seattle is about signing Clark long-term. Seattle may well tell teams “nope, sorry.” But teams figure to also call on Clark, as they apparently are on other tagged players such as Kansas City’s Dee Ford, until the tagged players are under contract (Clark has yet to sign his tag, and teams can also rescind tags until the players signs it. Once signed, the salary is guaranteed for that season). Given the way coach Pete Carroll and Schneider have talked about Clark, who had 13 sacks last season in what was his fourth year in the NFL, it’s hard to imagine it wouldn’t take a pretty absurd haul for the team to consider trading him. But again, if the Seahawks were to think that getting something long-term done with Clark is going to be difficult, you never know. Draft analysts are tabbing this year’s class of defensive ends as one of the best in recent memory. Buffalo has picks nine and 40 while the Colts have picks 26, 34 and 59. Seattle, meanwhile, has just four picks overall — number 21 in the first round and then nothing again until 85 in the third. Both the Colts and Bills also have a ton of cap space — the Colts are first with $102 million and the Bills fourth with just over $75 million, according to OvertheCap.com — so each is among the teams that has more flexibility to make some aggressive moves. So maybe if the Seahawks got to a point where they don’t think Clark can be signed, or they don’t want to go into the season with him playing on a tag and a still-uncertain future, they could try to get a few high picks, knowing they could draft a possible replacement for Clark, and then also know Clark’s $17 million salary would come off the books and they’d have that money to play with to sign another end or two. Assuming Glazer’s tweets are accurate, teams are at least going to let Seattle know there may be an option if the Seahawks feel they need one.